T minus 10 days to go! You’ve already watched A Christmas Story 5 times in the past week, so it might be time to get up and do something productive. 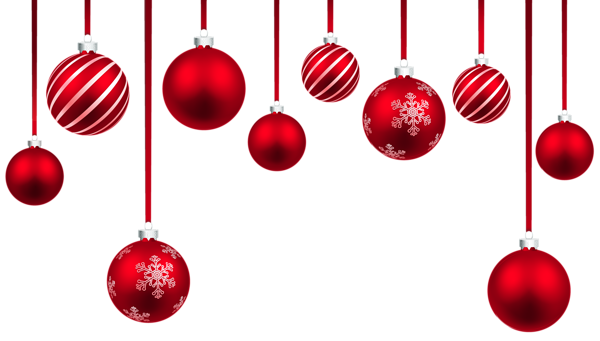 Here are some ideas on how to spruce up your home with some DIY Christmas décor. All of these decorations are simple, super easy to make, and will be a wonderful addition to what decorations you already have set up. How appropriate for us wine-o’s! Get this classy look for your home in just a few easy steps. 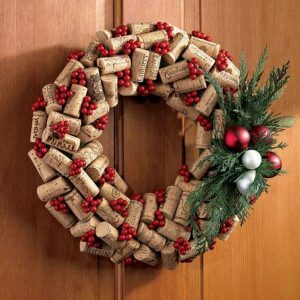 Apply the hot glue down the side of the cork and firmly place the corks on the wreath side by side (hold for a few seconds to make sure they stay). 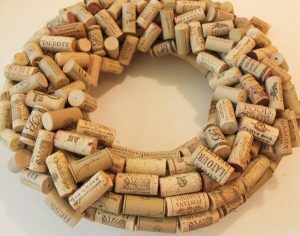 After you’ve completed a neat layer all around the wreath, add another layer of randomly placed corks. Then get creative and add your embellishments! 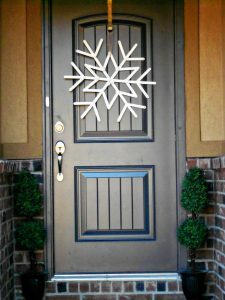 These easy snowflakes look great in place of a wreath on your front door, or in clusters of several sizes on a wall in your home. In just a few minutes, you can create your own. Spray paint the popsicle sticks. 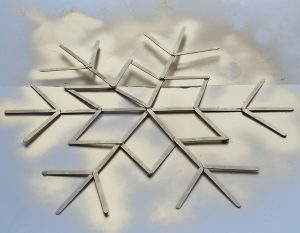 Then, one by one, place the 6 sets next to each other, forming a snowflake. 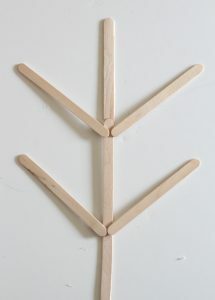 You can make larger and smaller versions, and even create a design of your own. 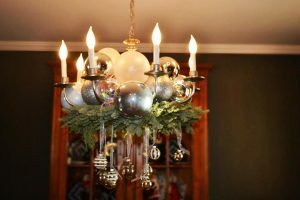 Spruce up your dining room chandelier with some Christmas sprit! This is super easy and adds so much to the room. Ornaments, Ribbon, Greenery, and any other leftover Christmas décor you have! Directions: This is my favorite, because you can really do what you want with it. Here’s your chance to get crafty and see what you can do with what you have laying around. 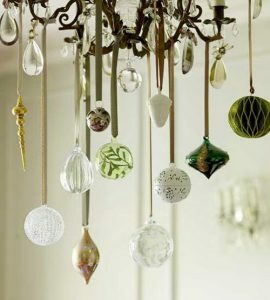 Take some Ornaments and tie them at different lengths. 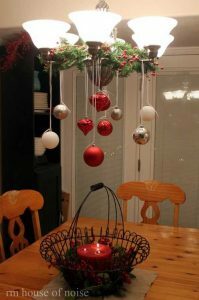 At the top of the chandelier, cover the base with greenery and berries (you have have to secure this down with ribbon, depending on which kind of base you have). Maybe throw in some oversized ornaments to the base on top of the greenery. The possibilities are endless! These fun little crafts look great clustered in a centerpiece. Place several onto a silver tray, add some tall candle sticks, some loose silver ornaments and whatever else your heart desires. Another idea is to use these as a place setting for Christmas dinner, just write the appropriate person’s name on the pot! Silver Stars (You should be able to find these at a store in the section where they sell wrapping paper. If not, substitute with a miniature bow). 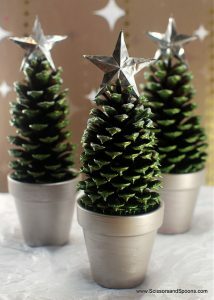 Spray paint the pine cones green and sprinkle some silver glitter on the tip of the scales (to resemble snow!) and let dry. Spray paint the pots silver, let dry. Stick the pine cone into the pot, and secure the star or bow to the top of the pine cone. A hot glue gun may be needed to secure both items into their proper places. And voilà! Mini Christmas trees! 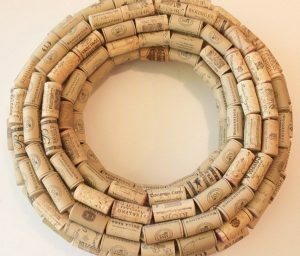 This entry was posted in Wine and tagged christmas, decorations, DIY Christmas Decor, pinterest, Wine, wine corks, wreaths. Bookmark the permalink.